The Alamosa Live Music Association is pleased to present 9Mile at Sundays at Six, August 12, in Cole Park, Alamosa. Go to Leon Memorial Hall at ASU, in case of rain. From the Gunnison Valley on the Western Slope of the Colorado Rockies comes 9Mile – original Colorado flavored Country/Rock/Americana. Chris Coady has recently been recognized by Nashville Songwriter’s Association as “One to Watch” for his song concepts and the lyrical quality of his songwriting. 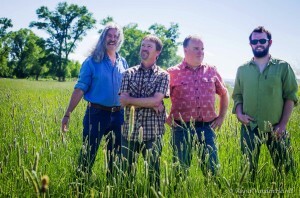 Influences include John Hiatt, John Prine, Robert Earle Keen and the Eagles. Kevin Doherty’s lead guitar style is akin to the likes of Mark Knopfler, Eric Clapton and Junior Brown, while at the same time bringing a contemporary “Millennial” Country Rock sound to the band. Coady and Doherty, together with the energetic percussion and harmony vocals of Jack Lucido and the solid bass lines of Brian Camp, have created that 9Mile “feel good” sound that keeps bringing audiences back for more!